While we were in Washington State we were able to travel 3 hours from our home town to Walla Walla, WA to visit with Tony’s sister and her family for a night. 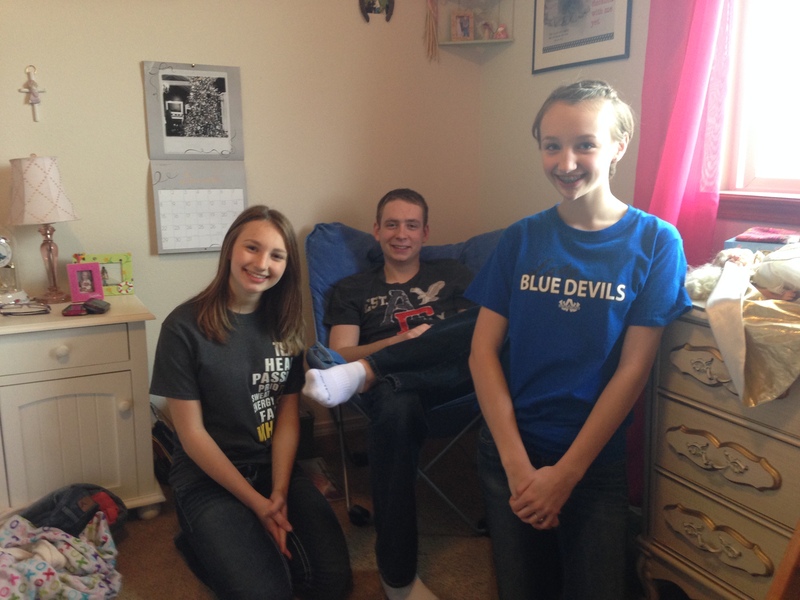 It was such a wonderful visit! We weren’t able to see them before we left for New Hampshire last year, so I believe it had been almost a year and a half since we’d visited with them. Far, far, too long. These are our gorgeous nieces, Maggie and Olivia (Brandon is in the chair). Such sweet things and so hilarious! Smart and beautiful, well-rounded, polite, pleasant, girls. I would steal them in a heart beat and bring them back to New Hampshire to live with us if I could! We had so much fun after the delicious dinner Alysia prepared just sitting together in the living room in our PJ’s, chatting, catching up, and listening to the girls tell funny stories. I haven’t laughed that hard in a long time! While we were visiting, Maggie showed me how to make a knitted arm scarf. So crazy! Knitting, by just using your arms. You can go here for a tutorial I found on YouTube. You can make a scarf in 30 minutes or less! Here’s a picture of the one they made for me. I’m thinking I may have to mail them some yarn and a little cash to make me more scarves! The next day while the guys and all the kids went shooting at the range and wandering around town, the ladies, Alysia, Sandy my mother in law, and I, set off to do a little shopping and hit a Starbuck’s. Starbucks are few and far between on the east coast so I wanted to stop as often as possible on our trip through the West. 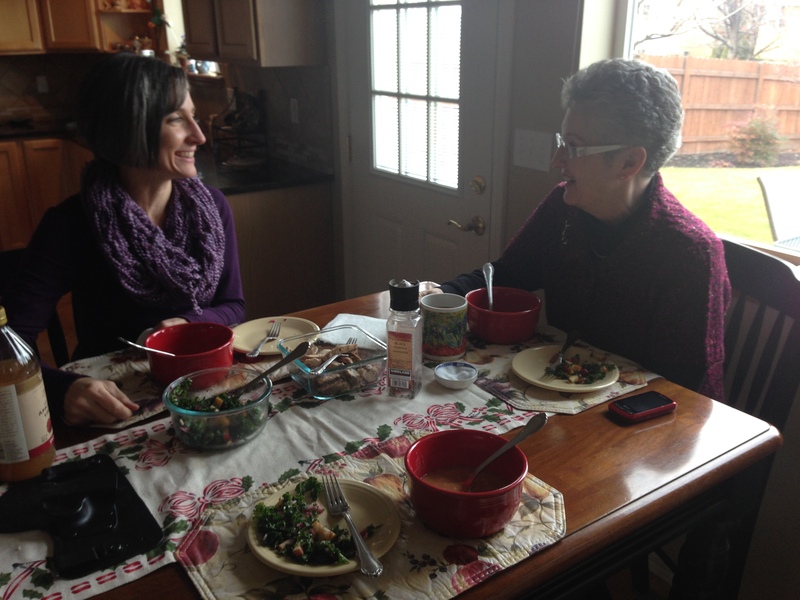 We weren’t feeling like doing a lot of shopping so we headed home to Alysia’s where she served us home-made bean soup and her kale salad. 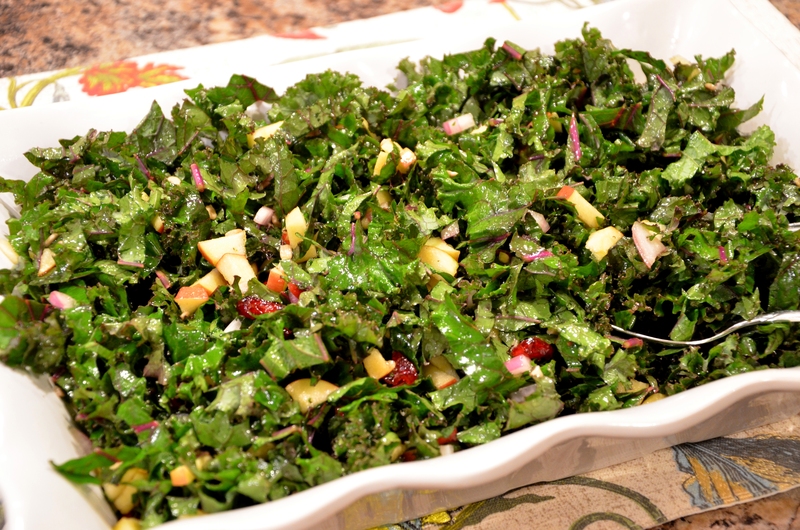 I’m going to call it her “famous” kale salad because she said she takes it to almost every gathering and although she worries that people will grow tired of it, it’s always eaten and raved about. And I would have to agree, it is delicious. I’ve thought about it every day since we left her house and have just now had the opportunity to make it. Even my husband loves it and he doesn’t like any savory or vegetable dish with nuts and dried fruit. 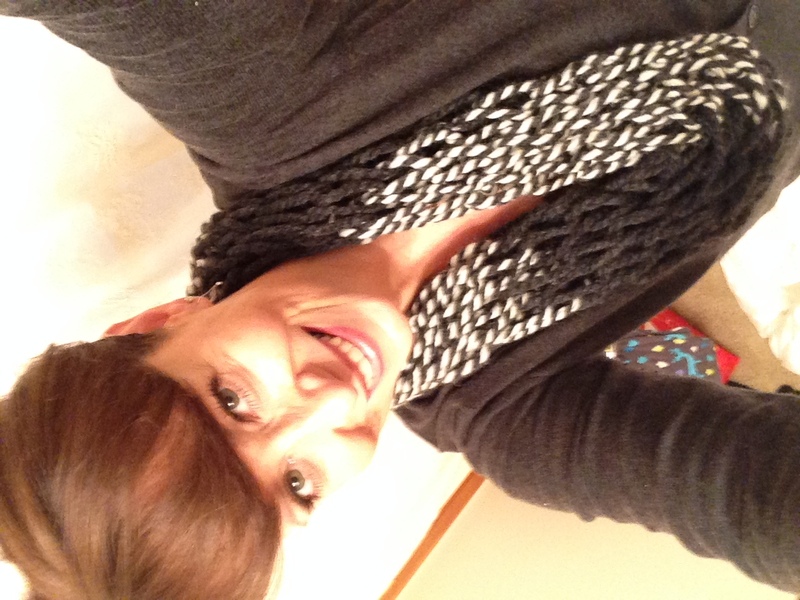 Notice that Alysia is also wearing an arm knitted infinity scarf! I believe I’ve gotten the recipe correct…I wrote it down while we were there and promptly lost it when I cleaned out my purse and thought it was an old shopping list. Then, I called her just the other day and wrote it on a piece of scrap paper on my desk…and sure enough, it has disappeared. So, rather than call her again and reveal that I’m a complete idiot, this recipe is from memory, I hope I do it justice. 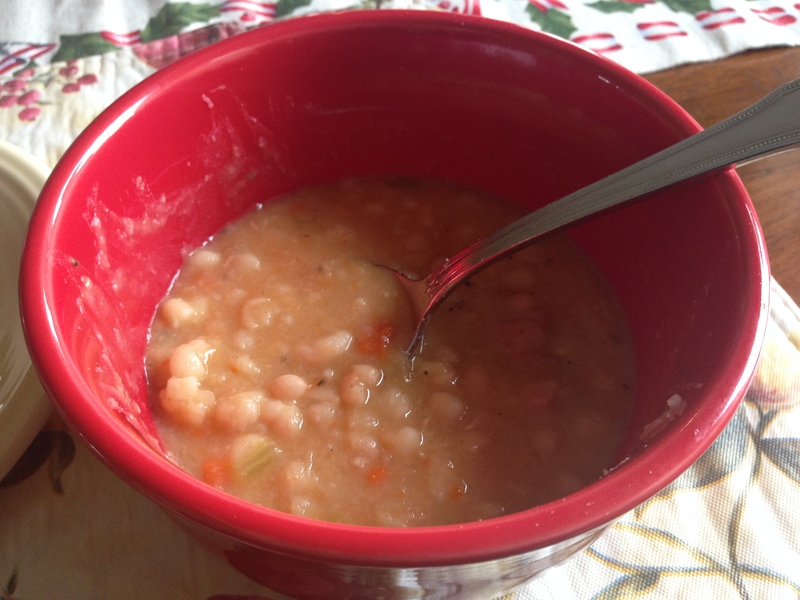 I will give you the amounts I used for about 6-8 servings, you can adjust it as needed. This salad keeps very well overnight in the fridge for snacking the next day. In fact, I probably ate about 4 servings for breakfast! 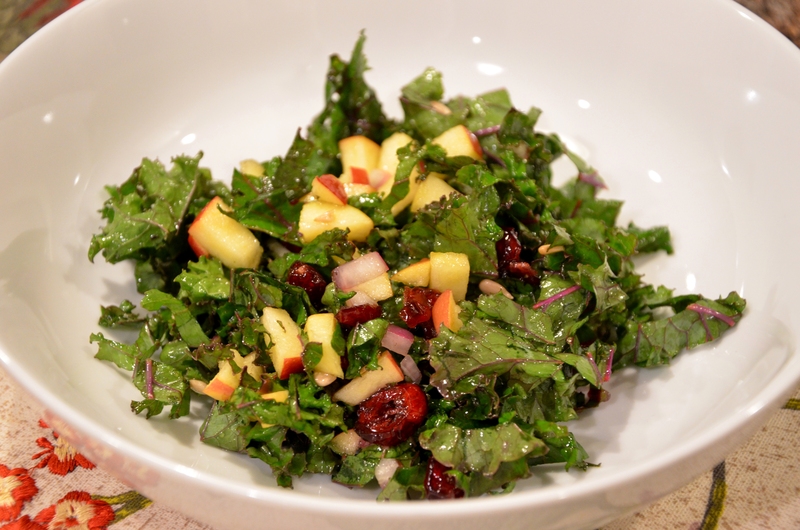 Place the sliced kale, chopped onion, diced apple, cranberries, and sunflower seeds in a large bowl and set aside. In a small bowl whisk together the maple syrup, apple cider vinegar, and olive oil. Pour over salad and toss until thoroughly coated. 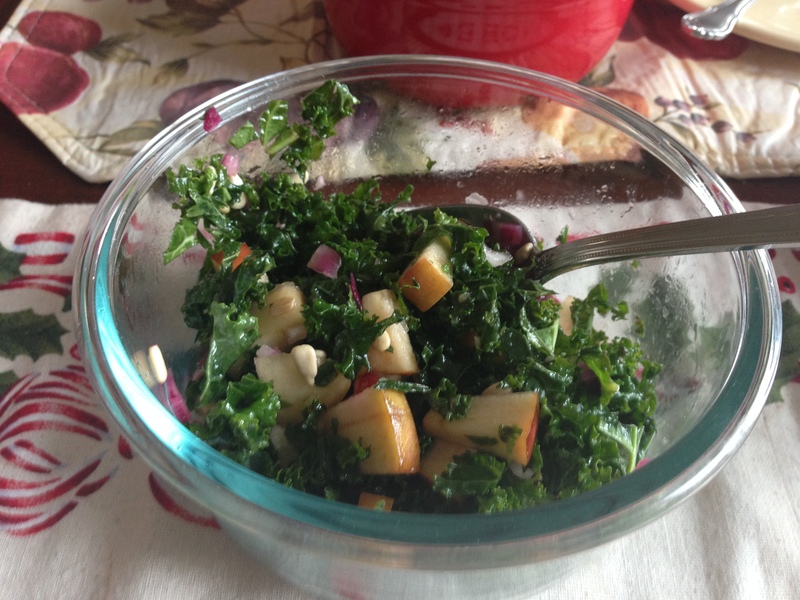 I just made this for lunch and now I know why Alysia Marie’s Kale Salad is Famous. This stuff is so good! I don’t usually like raw kale because I think it’s a bit bitter, but the combination of the fruit and the dressing takes care of that bitterness.l. The salad looks delicious. I can’t remember if I have had kale before, but this is a wonderful way to make sure I do in the future! Thanks for sharing 🙂 Now I’m heading to youtube to watch that video and learn to make that beautiful scarf!